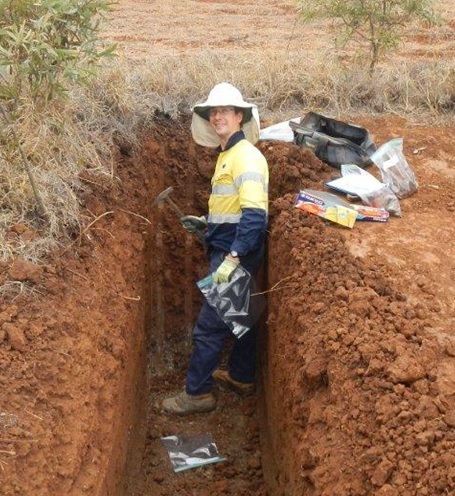 During Jason Choong’s second year of university he became interested in a soil science course that consisted of practical components and field work where he could be hands on working with soil profiles. He flourished under the mentorship of his honours professor. Now a graduate soil scientist, Jason feels that environmental stewardship is meaningful and important but often overlooked. He signed on because his honours project mirrored what BeneTerra puts into practice. He attained a Bachelor of Agricultural Science, with Honours, from the University of Queensland. His thesis focused on the Effect of basalt soil amendment on soil properties and plant growth. When he’s not researching or working, he enjoys a game of social badminton. Along with his background working in environmental management, Calvin Leech has submitted his PhD in Soil Science with a Thesis that focuses on bio remediation of polycyclic aromatic hydrocarbon (PAH) contaminated soils using a composting process. The PAH compounds are generated during incomplete combustion materials such as coal and some of these PAHS are U.S EPA priority listed pollutants due to being known or potential cancer-causing compounds. During the study he determined the major limitations for the composting remediation strategy and implications for remediation of PAH contaminated MGP soils. Calvin has a Bachelor of Resource Management from the University of New England and is a PhD candidate in soil pollution research. He joined BeneTerra because of the unique opportunity to conduct applied soil science across a range of industries. In his free time, he likes to compose music, ride his mountain bike and play hockey. Coby Seaborn joined BeneTerra as a supervisor because he enjoys working with a diverse range of clients and especially BeneTerra’s hands-on approach to environmental management of disturbed environments. “I’m looking forward to learning and gaining quality experience in disturbed land management,” he said. He brings with him a variety of industry experience with past roles in water management; ground and surface, land protection, weed and feral animal control, community planning, and as an environmental coordinator in oil and gas. He holds qualifications in wilderness reserves and wildlife, as well as natural resource management. Alastair Berking, our newest intern and avid rugby player, specifically chose BenTerra because it’s environmental services offered are unique and incorporate numerous ideas and concepts that are possible groundbreaking technologies in the near future. “I believe BeneTerra is the perfect place to be for that reason,” Berking said. The fourth year Griffith University student is in his final stages of completing a Bachelor of Environmental Engineering. For the last two years, his primary focus has been wastewater and stormwater treatment systems. The soon to be graduate has hit the ground running at our Toowoomba site. During his internship he’ll be assisting engineers on the active Benevap projects with tasks including; the conducting of experiments and tests, collecting of data and compiling of operational/safety procedure documents. It’s also the people at BeneTerra Alastair is enjoying “I like the practical application and collaboration of working with other engineers,” he said. BeneTerra completed the evapoconcentration of landfill leachate that had made its way into a stormwater pond following weather events that followed Cyclone Debbie. The BV300 reduced 470,000 litres to 3,500 litres over a few days and nights during which time clean steam was released to atmosphere. The constituents in the leachate were concentrated and placed back into the landfill. BeneTerra’s bench strength has been improved with the addition of three new employees. They bring new energy and a wealth of experience that will enhance the quality of service provided to customers. Our Aussie team recently completed a very difficult rehabilitation of a pipeline corridor in central Queensland. Previous contractor’s attempts at erosion control had failed. and The worst section was 120 metres long and the average slope was 30% slope. BeneTerra Land Resources Leader, Glenn Bailey, presented a paper on November 17th, 2015 in Minneapolis at the Soil Science Society of America meetings. It was entitled “Pedological Implications for Rehabilitating Coalbed Methane Ponds – using soil material identification to deconstruct water storage ponds and rehabilitate pasture land.” The paper, co-authored by John Zupancic, discussed techniques developed by BeneTerra in Australia to rehabilitate pond sites where the original soil materials had been scattered and blended during construction making it difficult to re-establish productive pasture land. To view or download the presentation click here. BeneTerra has just commissioned its first mobile BeneVap™ unit, the BV-300. She is affectionately named Rhonda and is ready to go on the road to demonstrate her prowess vaporizing the toughest wastewater. This system is designed to connect to natural gas sources – particularly where it is being flared.